Impossible crime? Call an impossible star…. Sometimes, the biggest mysteries aren’t just about figuring out who committed the crime. Sometimes, it’s about figuring out how the culprit pulled off the caper in the first place. Like how a three-story multi-ton sculpture was stolen, or how an experimental concept car was taken from a freight train moving at full speed. When the police can’t figure it out, and the insurance company is on the hook for possibly millions of dollars, that’s when they grudgingly call in the rare man who can figure out the impossible… and that’s Banacek. Insurance investigator Thomas Banacek (George Peppard) was cool, suave, and had a taste for the high life. From his old-style luxury residence in the expensive Beacon Hill district of Boston, he was called upon to solve the most unusual crimes. But his talents came at a price. If he solved the case and recovered the lost merchandise, he would receive 10% of what the insurance payout would have been if the insurance company had been forced to pay for the “lost” item… and since some of the multi-million dollar insured items included jewel-encrusted coaches and ancient Greek treasures, he got a pretty good payday for his work. Plus expenses, of course. And Banacek had expensive tastes. There's style... and then there's Style! 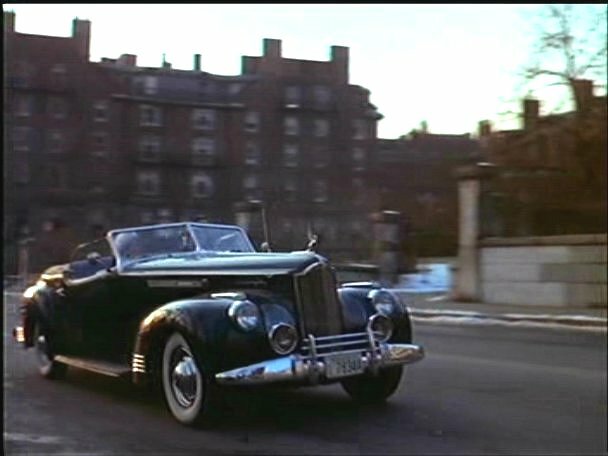 His usual method of travel was a 1941 custom Packard, a beautiful and elegant car that showed off not only his expensive taste, but also his desire for style and elegance. He was aided (and occasionally distracted) by the driver of the car, his trusted chauffeur Jay (Ralph Manza), who would always offer up some wild conspiracy theories about how the crime might have been committed. Jay’s ideas were rather preposterous, but sometimes served to help Banacek discover a new clue or angle. And when you’re trying to figure out how a multi-million dollar thoroughbred racehorse disappeared in the middle of a lap around the track, ideas are needed, no matter how outlandish they might be. His other source for ideas (likely more intelligent ones) was Felix Mullholland (Murray Matheson), a dealer in rare and antique books. He not only shared Banacek’s love for the finer things, he was also an expert in art and history, and able to fill what few holes might exist in Banacek’s knowledge. 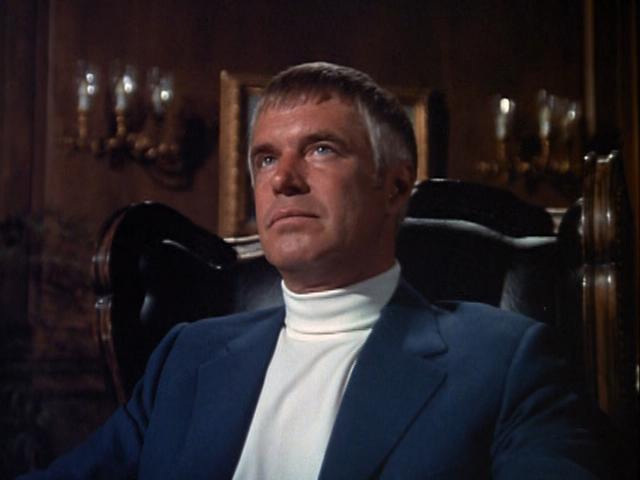 Felix also served as a bit of a mentor to Banacek, and there are hints in the series that the hero of our show hadn’t always been as smooth and elegant as he presently appeared. It was likely Felix who helped Banacek eliminate the rough edges of his youth (as he’s the only one allowed to call him “Thomas”). That having been said, Banacek wasn’t afraid to mix it up with the bad guys when necessary, but he was mostly a man who had learned to fight with his brains and his words, and only backed them up with fists as a last resort. Of course, with millions of dollars on the line, sometimes the villains were more than willing to choose physical threats and violence… but Banacek would rather prefer a verbal sparring match, especially when he so completely had them over-matched in the brains department. And he knew it. Whether it was to simply amuse himself, or to just spar with the numerous suspects verbally, many episodes had Banacek reciting one of the “old Polish proverbs” of his youth, usually with a bemused look on his face. The cocky investigator loved to spout his own brand of wisdom, but the truth is, these were never real Polish sayings, just lines made up by the writers of the show. The proverbs were almost as impossible to understand as the amazing crimes Banacek was trying to solve. But it was one more piece of characterization that made Banacek a unique creation. Actor George Peppard was still many years away from his career-milestone role in The A-Team, and Banacek was his first regular series gig. He flew through it with an apparent winning, engaging style, and the show was very successful, mostly thanks to his character’s charms. The success was also due to the amazing and clever plots cooked up by the likes of mystery greats Richard Levinson and William Link (who had created Colombo and adapted Ellery Queen for television). But behind those televised charms and smart plots was a difficult and tumultuous journey, with as many difficulties in real life as the plot of your basic impossible mystery story. Peppard is not exaggerating! Even before Banacek, he had a bit of a bad-boy reputation in the business, despite his impeccable looks and outward presentation. Just like Banacek, Peppard liked some of the finer things in life (such as women and drink), suffered no fools, and was never afraid to tell you whether he thought you were fine or foolish. And that included other actors, directors, producers, and network executives, all of which had run-ins with the man at one time or another along the way. But he did care about the work, and sometimes, that was all he cared about, feelings be damned. When you were the best, he let you know… and when you weren’t, he was never shy about telling you so. This is how “impossible” reputations are made in television…. Nothing is impossible... or is it? Like his character, Peppard at times believed that, in real life, he had many of his Hollywood “peers” over-matched in the brain department and, also like his character, he loved to spar with them. Executive Producer of the series George Eckstein would be awakened by annoyed phone calls at 3 AM from Peppard, demanding revisions to scripts and complaining about personnel. Now realize that Peppard and Eckstein were good friends and not foes… so imagine what reputation Peppard’s behavior would earn from those on the opposite side of the argument that didn’t have years of friendship in place…. 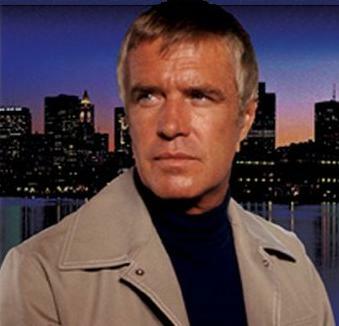 Banacek ran for 2 seasons, but only 17 episodes. It was part of a rotating set of shows on the NBC Wednesday Mystery Movie, along with series like Cool Million and The Snoop Sisters. It aired once a month or so, and therefore only made eight 90-minute episodes per season. NBC was willing to renew the series for a third year, worth a significant amount of money to Peppard (and Universal Studios), but Peppard, following his own trail, quit the successful show instead. And it’s kind of hard to do a show called Banacek without Banacek…. Why did he quit? Not the grind, necessarily, or even the constant battles. Those he was more than willing to fight. But Peppard was going through a divorce from his then-wife, actress Elizabeth Ashley, and he’d rather walk away and leave money on the table instead of giving half of it to her in the divorce settlement. And of course, leaving money on the table is something Hollywood simply can’t understand, for good or bad reasons, and one more reason for the “impossible” label was hung around Peppard’s neck. That label continued for many years. He was originally cast as Blake Carrington on the series Dynasty, but left after the shooting of the pilot due to “creative differences”. The role went to John Forsythe, and Peppard’s reputation took another hit. The only producer who was willing to deal with Peppard was Stephen J. Cannell, known as a bit of a maverick himself, and that would lead to the role Peppard is best identified with, Hannibal Smith in The A-Team. By this time, Peppard was still occasionally difficult, but now he had a producer who understood his behavior, and Peppard’s fights became less divisive and more about just getting the best possible work done, even though he was still willing to stop production once to make a point. To Peppard, it wasn’t about being impossible… it was all about getting it right. Sounds like a certain investigator I’ve seen near Boston. He’d probably tell you an old Polish proverb about the experience…. GEORGE PEPPARD (Thomas Banacek) was well-known as a movie star in the ’60s, having made a splash in starring roles in Breakfast at Tiffany’s, How the West Was Won, and The Carpetbaggers. His noted “difficult” status led to his conversion to a television career, and a critically acclaimed title role in Guilty or Innocent: The Sam Sheppard Murder Case. After leaving yet another series (Doctors’ Hospital) in the mid-’70s, he became a reformed alcoholic in 1979, and a few years later won his starring role on The A-Team. He died in 1994 from pneumonia, a complication of lung cancer. 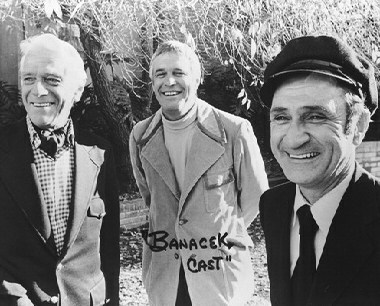 Matheson, Peppard, and Drury in a lighter moment on-set. RALPH MANZA (Jay Drury) is almost the definition of a character actor, having had an almost half-century career on television. From 1955’s Highway Patrol to 2000’s Boy Meets World, he appeared in 120 different television series, and yet only as a regular in less than a handful. Other than his featured role on Banacek, he’s probably best known as a recurring character on Newhart, but has played everything from Catwoman’s henchman on Batman to a mall Santa Claus on Punky Brewster. He died of a heart attack in 2000, working until the end. MURRAY MATHESON (Felix Mullholland) was a veteran of the live television era of the 1950’s, playing roles on the Plymouth Playhouse, Kraft Theatre, and Studio One in Hollywood. His most acclaimed role was as the Clown in the landmark Twilight Zone episode Five Characters in Search of an Exit. He played a great many roles in other speculative shows, like Night Gallery and The Invaders. One of his final roles was in 1983’s Twilight Zone: The Movie, returning his career full circle. He died in 1985, at the age of 72. Banacek is available on DVD, both as a complete series, and as season 1 and season 2 individual sets (but get the complete series, as it’s not only a better value comparatively, but it also includes the 2-hour pilot episode Detour to Nowhere). There’s also a “best of” release, containing 4 episodes from the series (including my personal favorite episode, To Steal a King). There aren’t any really terrific reference sites for the show, which is surprising considering how fondly it is remembered (since the series was rerun extensively as part of the “Morning Mystery” set of shows repeated on the A&E network for many years, along with McMillian and Wife and Ellery Queen). But there is a list of all the Polish proverbs from the series available, so you can try to figure out what any of them mean (and a YouTube video of clips from the show, with Banacek uttering all those words of wisdom himself). Banacek was a clever show, and the title character was played by a clever man. In fact, sometimes both the show and the man were too clever for their own good. But both the series and the person knew exactly what they wanted to be, good or bad, and fought tooth and nail to be exactly that vision. Neither the crimes nor the star were as truly difficult as their initial presentation, they only seemed that way from the outside looking in. What seems impossible at first usually just takes some time to figure out. Aired at Friday 8/7 Central? No. As part of the “wheel” of shows on the NBC Wednesday Mystery Movie, it aired monthly, usually at 8:30/7:30 Central.